Developing an understanding of how people view CCS technology can, in turn, help in developing effective programs for risk communication. This is important because it can form the basis for working with the public to develop projects. Understanding the way in which people evaluate project risks is a topic that has been studied extensively in the social science literature, and we are now gaining direct experience from early CCS projects. This report aims to provide a better understanding of what we have learnt about the ways in which people view risk more expansively than just a technical and scientific assessment would indicate and the importance of addressing this view. 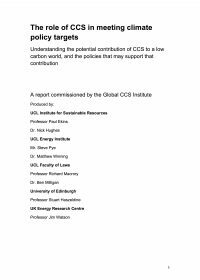 The report builds on previous work including a communications / engagement toolkit for CCS projects and a social site characterisation toolkit. It is intended to assist those involved in the planning and implementation of CCS projects to develop more effective and productive stakeholder engagement programs. The report is broken down into the different sections – covering various aspects of risk and communications: following the introduction, Part 2 of the report reviews the theoretical underpinnings for an approach to risk communication. For Part 3, the authors interviewed representatives from five North American CCS projects to review project experience in risk communication and summarise lessons learnt from those experiences. Based on these lessons, the authors suggest, in Part 4, an iterative five-step strategy for learning how the community views the project and for developing effective risk communication programs. This final part also provides the reader with a series of pointers and resources for use in developing risk communication programs.